I am a HUGE fan of sleep. I love naps and long nights- just give me a comfy bed, a soft blanket, and a cooler temperature so I can wrap up and I am a happy girl! But even though I know how wonderful sleep is, there are times that I spend precious sleep time on my cell phone, Facebook, Twitter, Pinterest or watching TV instead of shutting things down and resting. And at times there are other things that keep me from sleep, like my adorable son, or chatting with my husband- or my mind working overtime worrying about this or that... But did you know that sleep is a gift from God? Yep, sleep is a gift given by God to his beloved- who, as Christians, we are! But we can't miss the first part of the verse, "It is in vain that you rise up early and go late to rest, eating the bread of anxious toil." Is God saying we should sleep in and go to bed early while not eating bread? Umm not exactly. The first verse of this Psalm says that unless the Lord is the one doing the work or watching in the night, then those who try to do it without him do it in vain- or for nothing. 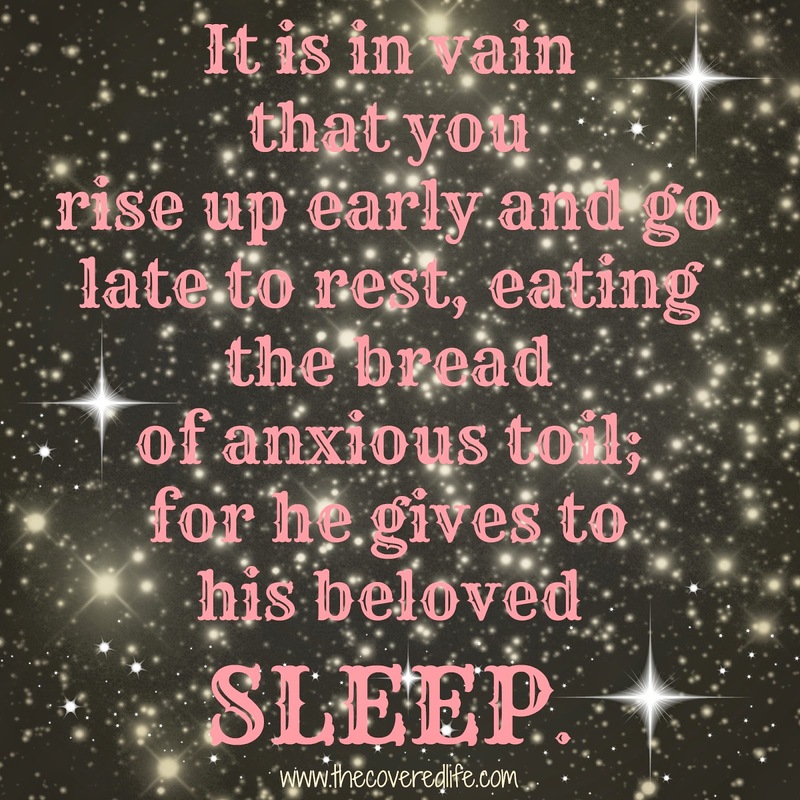 So this verse is carrying that same message saying that God has given the gift of rest and those that neglect sleep for their own anxious toilings are doing so for nothing. This includes working for selfish gain or even staying up late with those overactive anxious thoughts. Striving after worldly fame and fortune is fruitless and vain. Instead we are to rest and be still in God, quiet and content, trusting him and not being anxious. Too often we let selfish ambition and worry over worldly troubles rob us of our rest. But sleep brings refreshment and renewal, which God knows very well that we need daily. And in using that rest as God intends, then we are better able to serve him and give him the most glory. I have a friend who has a son who is five days older than Bug and a few months ago she posted a status on Facebook that said something to the affect of, "I don't know why my son fights sleep so much when it is so good." (Sorry Stephanie, if I murdered that quote.) I had to laugh because I know how true that is and uttered the same thing to my crying baby on multiple occasions. And sleep IS good! And sleep is a gift. Yes, when you have children you will lose sleep and you may lose sleep talking to your spouse, staying up with a friend, or being a chaperone at a lock-in (which is more difficult to recover from the older I get) and there may be some of you who have chronic pain and sleep escapes you. If this is you then know that it is but for a season that your children will be small and I've heard you miss these days; sometimes the only time my husband and I have to talk about our days and plans is when we are laying in bed; and being a friend and serving the Lord are wonderful opportunities to show the love of God to others. And for those in pain I am so sorry for your struggle, and though you may not be able to sleep fully, know that you can still take part in the gift from God by resting in him and allowing him to work through your life. Sometimes it is inevitable that we will lose sleep, just don't let other stuff rob you of your sleep that are for no good purpose because they aren't part of God's purpose. Are you spending your time working as God has called you or are you striving in vain for your own wants? Are you allowing social media, TV or anxious thoughts to rob you of precious rest that God wants for you? Tonight, "unplug from the matrix" as my husband likes to say and quiet your mind and soul with prayer, "casting all of your anxieties upon him" (1 Peter 5:7) and bask in the wonderful gift of sleep!